All Princess Chatter readers should read this report, word for word. This story is now going viral and it should. Miami-based global cruise operator Carnival Corp. is reviewing claims a ship operated by its subsidiary Princess Cruises ignored a distressed fishing vessel in the Pacific Ocean, according to a report from The Guardian. "Earlier this month two men died on a small fishing boat that was lost at sea for 28 days. But the tragedy may have been avoidable. Passengers aboard the Carnival Star Princess Cruise Ship say that they spotted the drifting boat in the Atlantic Ocean, but the ship refused to stop for help." But then they just went on their way. "It was a really big, white ship. I was waving a red T-shirt, and Fernando was waving a bright orange life jacket over his head, Vasquez, the crew's sole survivor, said in an interview with panama-guide.com. "For a minute it looked like they were going to turn to come for us, but then they just went on their way." 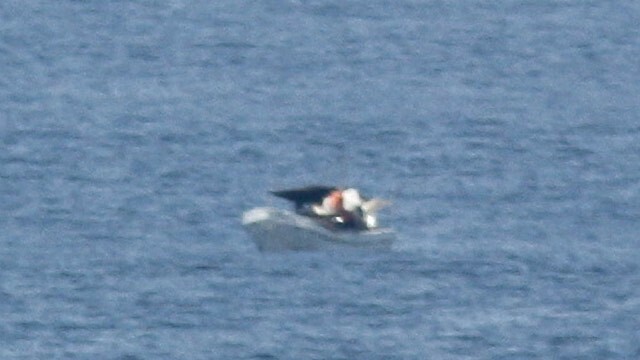 Jeff Gilligan of Portland captured this photo of a small fishing boat that appeared to be in distress 130 miles off the coast of Costa Rica. Play this ABC news video at the link below then tell me if you think that Princess is lying. "The Star Princess is registered in Bermuda. An official with Bermuda's Department of Maritime Administration says his office is in contact with Princess about the incident but hasn't determined yet whether it will conduct a full investigation." "It is a violation of maritime law to not offer assistance to another ship in trouble." This whole incident is very troubling; I just can't believe a captain would ignore a vessel in distress. But then a few months ago I would never have thought a captain would jeopardize his ship, his passengers and his crew just to amuse his girlfriend and some local dignitaries. What I don't understand is, couldn't the officers on the bridge see the same thing the bird watchers were seeing; don't they have good binoculars too? And even if they didn't see it, once the watchers reported what they saw, or think they saw, wouldn't any reasonable officer follow up, knowing full well that if the birders were right and they ignored the incident, the damage to Princess' reputation would be great--even before the loss of life came to light. Right now there is a lot of rumor and speculation swirling around; the information never reached the bridge; the captain thought the fisherman was waving to think him for avoiding his nets; the captain couldn't reach the fishing fleet because they didn't have radios; all of it rings hollow and is even contradictory: if the information never reached the bridge how could the captain see the fisherman waving--one of these statements has to be false. It saddens me that cruising has suffered another black eye; and especially since it involves a Princess ship. But I will withold judgment until all the facts are in. A lot of people are getting a lot of publicity out of this incident; and the longer it stays front-page the more publicity they get. I can't help but feel a logical explanation is forthcoming and then we can put this one to rest. Princess Cruises deeply regrets that two Panamanian men perished at sea after their boat became disabled in early March. Since we became aware of this incident, we have been investigating circumstances surrounding the claim that Star Princess failed to come to the aid of the disabled boat, after a crew member was alerted by passengers. The preliminary results of our investigation have shown that there appeared to be a breakdown in communication in relaying the passenger's concern. Neither Captain Edward Perrin nor the officer of the watch were notified. Understandably, Captain Perrin is devastated that he is being accused of knowingly turning his back on people in distress. Had the Captain received this information, he would have had the opportunity to respond. We all understand that it is our responsibility and also the law of the sea to provide assistance to any vessel in distress, and it is not an uncommon occurrence for our ships to be involved in a rescue at sea. In fact, we have done so more than 30 times in the last ten years. We deeply regret this incident and are continuing our investigation to fully understand the circumstances." "Princess had earlier claimed the ship didn't stop because officers believed the fishermen were happily waving because the vessel shifted course to avoid their nets." "Barred from going to the bridge herself to notify the ship's officers, Meredith said she told a Princess Cruises sales representative what they had seen, and he assured her he passed the news on to crew. The birdwatchers said they even put the representative on one of the spotting scopes so he could see for himself. Meredith went to her cabin and noted their coordinates from a TV feed from the ship, booted up her laptop and emailed the U.S. Coast Guard what she had seen. She said she hoped someone would get the message and help. She sent a copy to her son. When she returned to the promenade deck, she could still see the boat. But nothing happened. The ship kept going. And the little boat with the waving men disappeared. "We were kind of freaking out, thinking we don't see anything else happening," Meredith said. Gilligan could no longer bear to watch." "The three passengers, identified as Judith Meredith and Jeff Gilligan, both from Oregon, and and Jim Dowdall of Ireland, all claimed to see the boat while out bird-watching on the ship’s deck. The passengers alerted a member of the crew who worked in the sales office, took pictures of the distressed boat, and assumed that appropriate measures to help the three Panamanians were being taken. The sequence of events after that point are what is under investigation by Carnival."